If the house of interest is in a predominately heating climate, and the house is not overly shaded in the wintertime, then the guidelines in the IECC 2009 and 2012 for windows may lead to the selection of low solar heat gain coefficient (SHGC) windows. However, high SHGC could result in lower heating and overall energy consumption. This thesis is demonstrated in this report. The latest two International Energy Conservation Codes, IECC 2009 and IECC 2012, have requirements for windows (called fenestration) and doors with glass that are counterproductive to saving energy in many parts of the United States, as well as other countries that have areas that are in predominantly heating environments. 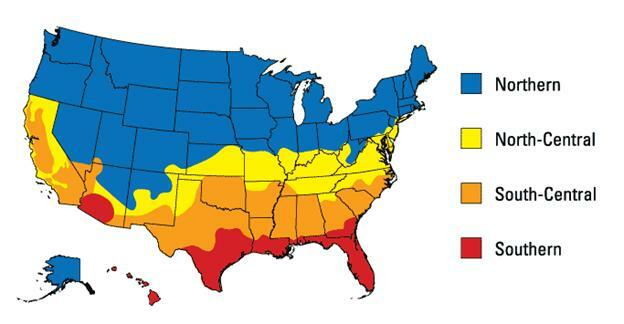 For the purposes of the IECC, the U.S. is divided into climate zones as shown in Figure 1. 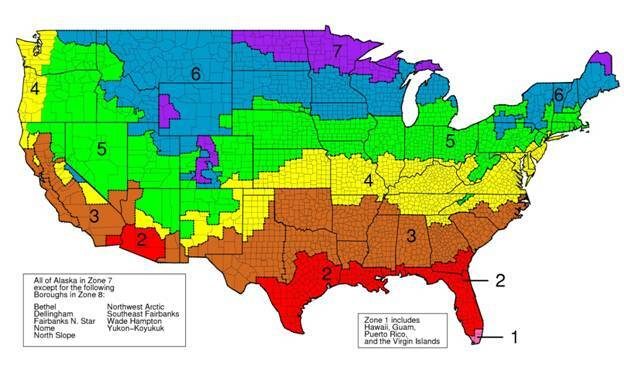 Thus, climate zones 1-3 might be considered southern U.S., with predominantly cooling requirements. Zones 4 and some of 5 might be considered middle U.S., with significant heating and cooling requirements. Most of zone 5, and all of zones 6, and 7 would be considered predominantly heating environments. The IECC, which might be mostly driven by the U.S. Dept. of Energy (DOE) and window manufacturers, has come up with the code requirements for fenestration (windows) as shown in Table 1a for IECC 2009 and 1b for IECC 2012. The U-value is the maximum thermal conductivity that is allowed in the different climate zones. The U-value is simply the inverse of the thermal resistance R-value, so the lower the U-value, the higher the R-value. The same values are given in Tables 1a and 1b expressed in SI units and United States units. (“United States units” or “American units” are used to refer to what used to the called “English” units, as even the English have abandoned using these antiquated units, and only the US continues their use.) Tables 1a and 1b also shows the maximum solar heat gain coefficient (SHGC) allowed, which is the fraction of the incident solar energy that is transmitted by the windows to the interior of the house. Essentially these standards require that the more northern climate zones require lower thermal conductivity windows, that is, higher thermal resistance. Further, the southern zones have strict limits on the solar heat gain allowed through windows, while the northern zones are unrestricted for SHGC. These standards have resulted in an unintended consequence that actually wastes energy as discussed below. Table 1b. 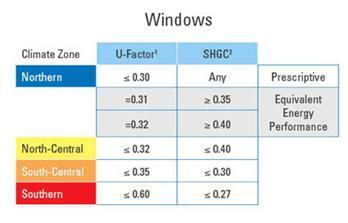 IECC 2012 Fenestration (Window) Code Requirements in Both SI and U.S. units. Some typical window thermal properties for high and low solar gain double-pane, low-emissivity (low-e) windows are provided in Table 2. These window properties were taken from the DOE Lawrence Berkeley National Laboratory (LBNL) computer model RESFEN (residential fenestration), and were labeled as typical for wood or vinyl-frame windows. The U-values given in Table 2 are typical for air-filled, sealed insulated glass units. The U-values can be made lower by filling with argon gas, but such gas fills are generally not available at high altitudes, such as the location of the REL, and many other residences in the western U.S. Also the argon can leak and be replaced by air in the case of seal failure. Notice that the low solar gain windows meet the specification for northern U.S. latitudes of having U-factors less than 2.0 W/(m2 K) or 0.35 Btu/(hr ft2 F), but the high solar gain windows do not meet the 2009 or 2012 standards. The high solar gain windows let in 77% more solar energy, and conduct only 9% more energy out of the house, but are forbidden by code to be used in northern latitudes where they might be very helpful in providing passive solar heating for homes. By doing a considerable amount of extra work, it is possible to use the higher solar gain windows if their U-values do not exceed an absolute limit of 2.3 W/(m2 K) (or 0.40 Btu/(hr ft2 F) for the IECC 2009 code, and if it can be proven that their use will lead to an overall reduction in energy use or is made up for by extra insulation in other parts of the house. This added effort is well beyond what most homeowners and home builders are willing and/or capable of doing. Table 2. Typical Window Thermal Characteristics as given in the DOE computer model RESFEN. So the use of high solar gain windows would result in more solar energy entering the home, but an increase in heat losses from the home. During the winter, the extra solar energy would be an advantage, but during the summer, it would be a disadvantage. In more northern climates, it is reasonable to guess that the high solar gain windows might be an advantage, while in southern climates, they would likely be a disadvantage. Rather than just speculating, it would be worthwhile to examine and quantify the effects of high versus low solar gain windows in different climate areas. That analysis has been done for different cities in the United States, with results as shown below. To quantify the effects of different solar gain windows on residential heating and air-conditioning energy use, the DOE LBNL computer model RESFEN (Version 5.0) was used. This computer model is available for free download (http://windows.lbl.gov/software/resfen/resfen.html), and is recommended to evaluate the effects of window placement and glazing type on energy use. It is necessary to define a house design to evaluate the effects of window type on energy use. The house design used for this modeling effort was based on the Residential Energy Laboratory (REL). The house was assumed to be a single story house with insulated basement, 149 m2 (1600 ft2) on the first floor, and to be very well insulated as shown in Table 3. These insulation levels correspond to what RESFEN calls its Zone 19 insulation package, and are similar to what is used in the REL. The package shown in Table 3 would be a typical insulation package for a well-built new house in most of the United States. Using a well-insulated house in the simulation allows the effect of glazing type to be examined more easily. The house was assumed to have a total window area of 6.20 m2 (66.7 ft2) on each side, which would correspond to four windows on each side, each measuring 1.04 m x 1.50 m (41” x 59”), again based on the REL. The shading level was set to “Typical” as defined by RESFEN on the N, E, and W sides, and as “Overhang” as defined by RESFEN on the S side. It would be good design practice to use an overhang on the south side of any modern home designed to allow passive solar gain in the winter and shading in the summer. The REL, which is at a latitude of about 38 degrees, uses an overhang of 0.61 m (24”) on the south side of the house for these purposes. Higher latitudes require more overhang. in both SI and American Units. The RESFEN calculations were performed for the baseline window glazing meeting the IECC code for northern climates, that is, low solar gain glazing in windows on all sides. Then the calculations were performed with only the south windows replaced by high solar gain windows. Next the calculations were performed with the south, east, and west windows replaced by high solar gain windows, and finally with all the windows replaced with high solar gain windows. These calculations were first performed for the location of the REL, using the weather and solar database for Alamosa, Colorado, which is the closest city with a similar climate to where the REL is located. The RESFEN results for Alamosa are shown in SI units in Table 4 and in U.S. units in Table 5. The baseline case of all low solar gain windows is shown in column 3 of each table, while column 4 shows the results for switching the south windows to high solar gain, column 5 shows the results for switching all but the north windows to high solar gain, and column 6 shows the results for switching all windows to high solar gain. Columns 7, 8, and 9 show the energy savings for the various configurations compared to the baseline case of using all low solar gain windows. Table 4 (and 5 in U.S. units) shows a total energy savings of 8.7% for replacing the south windows with high solar gain windows, increasing to 15.3% for replacing all but the north windows, and finally to 15.7% for replacing all the windows with high solar gain windows. So there is a dramatic advantage to using high solar gain windows in this sunny part of Colorado. How about the tradeoff in other parts of the United States? Note that these high solar gain windows are not allowed in the IECC 2009 and 2012 codes unless exceptional efforts are made to convince code authorities. Results for many other cities are shown in Table 4 (and 5 in U.S. units), divided into northern, middle, and southern areas. Results for houses in the seven cities classified as “northern” show a reduction in heating and cooling energy when using high solar gain windows on some or all sides of the house. The minimum improvement is 2.5% and the maximum improvement is 9.1% for the best configuration of low and high solar gain windows for the northern cities. For the five middle-latitude cities, improvements range from 2.8% to 32.3% for using the best mix of low and high solar gain windows compared to using all low solar gain windows. For the southern cities, the low solar gain windows are generally preferable as expected, although there are exceptions as shown in Tables 4 or 5. The energy use improvements can also be expressed in United States dollars as shown in Table 6. These annual costs all appear to be low relative to what might be the experience of the reader. Remember that the house used for these calculations was modest in size (149 m2 or 1600 sq. ft.), very well insulated, and the windows simulated were state-of-the-art. Also, no costs are included for heating hot water, lighting, appliances, etc. Table 4. Total Annual Heating and Air Conditioning Energy Use in SI Units for Houses with Low and High Solar Gain Windows on the North (N), East (E), West (W), and South (S) Sides of House. Table 5. Total Annual Heating and Air Conditioning Energy Use in American Units for Houses with Low and High Solar Gain Windows on the North (N), East (E), West (W), and South (S) Sides of House. Table 6. Total Annual Heating and Air Conditioning Costs for Low and High Solar Gain Windows on the North (N), East (E), West (W), and South (S) Sides of House. The Energy Star program requirements for windows are summarized in Figure 2 and Table 7 below. If the IECC 2009 code requirements are contrary to good energy efficiency in window selection for most northern and central U.S. cities, then the Energy Star program for windows, as defined by the U.S. Environmental Protection Agency and U.S. DOE, is at least as misguided. The Energy Star program again focuses on U-factor and does not properly credit high solar heat gain windows for passive solar heating. The Energy Star program assumes that if a low U-factor is good, then an even lower U-factor is better, and ratchets the U-factor for northern cities down from 0.35 to 0.30. This makes it even more difficult to certify a high solar gain window, that has been shown above to save energy, in the Energy Star program. There is an exception for energy equivalent performance, but still apparently a requirement for a U-factor below 0.32 for high solar gain windows. Figure 2. Zones Used in Energy Star Program for Windows. Table 7. Thermal Conductivity (U-Factors) and Solar Heat Gain Coefficient Requirements for Energy Star Program. It is clear from the results presented above that using high solar gain windows offers a significant advantage in reducing energy use in many parts of the northern and central U.S. This conclusion is only true for houses that do not have significant shading in the winter, which is perhaps more typical of the western than the eastern U.S. It is difficult to meet the IECC 2009 U-value specification of 2.0 W/(m2 K) or 0.35 Btu/(hr ft2 F) without using low solar gain windows, and the low SHGC windows reduce the amount of natural solar heating in homes. This is even more the case for the lower U-values specified in the IECC 2012 code. It may be possible to meet the U-value specification using high solar gain windows that have argon gas fills in the sealed gas units, but sealed gas units are generally not available at high altitudes. The high altitude restriction is due to the fact that sealed insulated glass units will likely crack when manufactured at low altitude and then transported to high altitude due to expansion of the sealed gas. Thus, in some cases, the IECC code requirements for windows result in the use of low solar gain windows that waste potential energy savings from passive solar heating. These codes should be changed to allow maximum U-values of 2.3 W/(m2 K) or 0.40 Btu/(hr ft2 F) in climate zones 4 through 8 so that air-filled, double-pane, high solar gain windows can be used in these zones. Many window manufacturers in the U.S. prefer to reduce their inventory by stocking only one type of window, the low solar gain windows. Canadian window manufacturers appear to be better about supplying high solar gain windows. Savvy builders and home buyers in northern and central parts of the U.S. and in Canada should evaluate the location where homes are to be constructed to see if there are obstructions like trees or buildings that will block wintertime solar energy. If not, and if the climate is heating dominated, then they should use RESFEN to verify that high solar gain windows will provide a reduction in energy use for their application. If so, then they should insist on high solar gain windows. The following window manufacturers may be able to supply high solar gain windows: Pella (Designer Series only), Thermotech, Inline, Fibertec, Serious, Milgard, Accurate Dorwin, Gienow, Marvin. It might also be possible to go to the glass suppliers like Cardinal Glass and ask them what window manufacturers use their high solar gain glass products. Pilkington (Energy Advantage Low-E glass) might be another contact to see what window companies use their glass.